NCGA jointly with Geophysics and Geology Department of SOCAR organized student contest for students studying geophysics at Baku State University and Azerbaijan State Oil and Industry University. Opening remarks at the event has been delivered by Shahveled Kocharli, NCGA chairman. Welcome address has been delivered by Elchin Shirinov, Head of Geophysics and Geology Department . Elchin Shirinov informed the audience on changes made in NCGA Charter and renewal of NCGA activity. 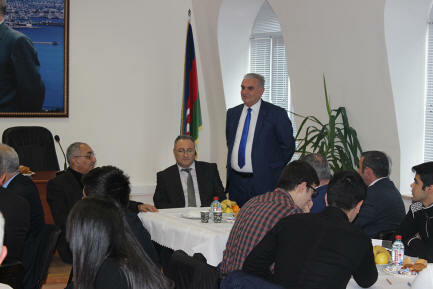 He has underlined the attention paid by SOCAR to students studying geosciences at the local universities and emphasized the importance of “Summer school” and scholarship programs implemented by SOCAR. Sh.Kocharli talking about the essence of the event, noted that each sphere is conventionally divided into three directions: education, science and production and currently NCGA aims to establish close ties between these three branches. 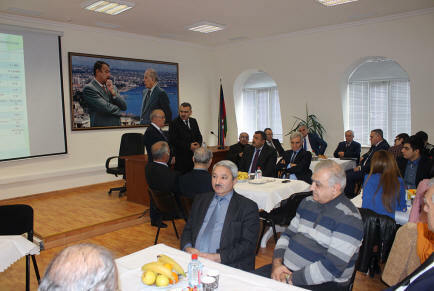 Other speakers included Tofig Ahmedov (ASOIU), Ali Novruzov (Oil-Gas Science and Project Institute, SOCAR), Yusif Shikhaliyev (GGD), Nariman Narimanov (ASOIU), Tarana Tahmazova (BSU), Vagif Seyidov (ASOIU) and Bakir Maharramov (Oil-Gas Science and Project Institute, SOCAR). Two teams from each university took part at the contest. The Jury involving members of NCGA Miradil Zeynalov, Hafiz Shakarov and Tarana Tahmasova (Baku State University) evaluated the answers of the teams and made decision on prize winner. First Prize winners were the members of Azerbaijan State Oil and Industry University team: Emil Ibrahimli, Gani Ganizadeh, Yunis Samedov and Davud Aghayev. The winners were awarded by Diplomas and small presents. NCGA team cordially congratulates the winners!